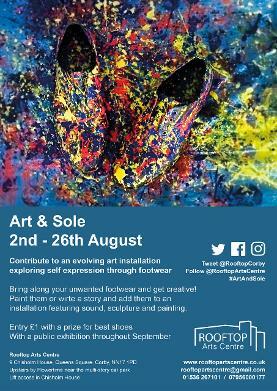 Art & Sole is a participatory art installation which encourages people to bring along old unwanted footwear throughout August and get creative by painting them or writing a story about them. Encouraging self expression and reflections on personal histories the shoes will create their own stories and fantastic narratives. Walking has long been a creative tool for artists, such as Richard Long’s, A Line Made by Walking, 1967, and Janet Cardiff’s The Walk Book, 2005 and the Resident artists at the Rooftop Arts Centre will be contributing work to the installation including sound, sculpture and painting. The resulting exhibition in September will be an eclectic mix of artefacts, stories and contemporary work exploring walking as medium and process. 18 local artists exhibit a range of Painting, Print, Photographers, Sculpture and more. 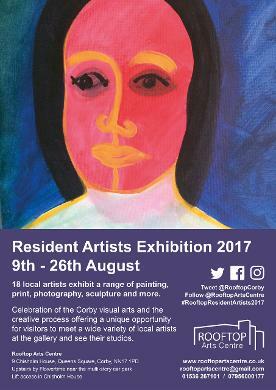 Celebration of the Corby visual arts and creative process, offering a unique opportunity for visitors to meet a wide variety of local artists at the gallery and see their studios. original artwork by a local artist.